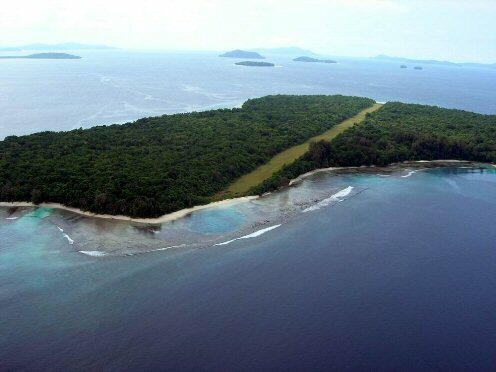 This story starts over 60 years ago, in November 1942, when 517 officers and men of the Royal Artillery, prisoners of the Japanese, arrived on the small island of Ballalae in the South Pacific, one of the Solomon Islands, to help construct an air strip. Not one of those 517 men survived beyond June 1943. They died from disease and malnutrition, from Allied bombing, which was intense at that time, and those still alive when the air strip was completed were massacred by the Japanese. The relatives of the men who died on Ballalae were never told officially how or where their loved ones died and it is only in recent years that the true facts have begun to surface. One of the men who died was my uncle Gunner Alfred Burgess and with his daughter, my cousin June, I began in 1995 to try and find out more about what had happened to him. Gradually the horrific story of what had taken place on Ballalae came to light with particular assistance from Peter Dunstan, a FEPOW archivist, and the Commonwealth Department of Veterans' Affairs in Australia. When Ballalae was reoccupied by the Allies, 438 bodies were discovered but none could be individually identified. Artefacts found in the grave proved these men were Royal Artillery personnel. 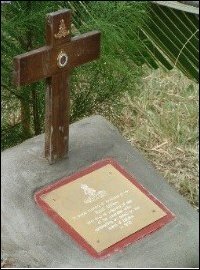 These bodies were subsequently reinterred at the Commonwealth War Cemetery in Port Moresby, Papua New Guinea. The air strip, which the men died building, is still in use today for domestic flights by Solomon Air. There is nothing on the island to commemorate the fact that over 500 British soldiers had died there and I became determined that this should be remedied. A plaque was obtained from the Royal Artillery Association but how were we to get it there and where would we stay as Ballalae is uninhabited and very remote? 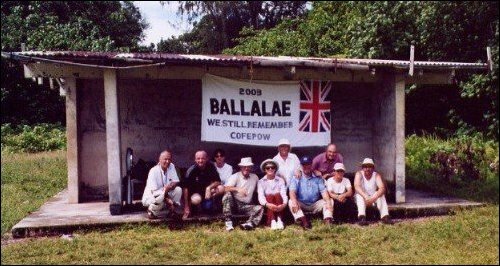 Fortunately for us, through the COFEPOW web site, we were approached by Chris Cowx in Vancouver who had been to Ballalae in recent years and saw that we were looking for up-to-date photographs of this island. How lucky for us that he had contacts in the area who could arrange accommodation for us as there are no hotels. With his valued help we were thus able to plan our journey to the other side of the world. On 27th June 2003 a group of 8 of us left Heathrow - me and my husband Robin, my cousin June, Bill Boswell and Chris Foley, son and grandson of Gunner E G Boswell (35 LAA) , Ken Young, son of L/Sgt W Young (35 LAA), Carol Cooper, chairman and founder of COFEPOW, and her husband Ron. 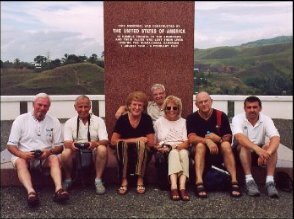 Later in the trip, on 9th July, for the final flight to Ballalae we were joined by Bill Davies, grandson of Gunner W Sutton (3 HAA) with his wife Kate and Brian Baldwin, British High Commissioner for the Solomon Islands and his wife Liz. 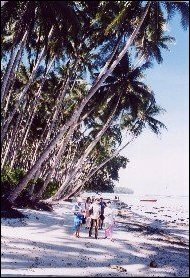 After much bad publicity regarding the Solomon Islands in the English press our visit was on the point of being cancelled at the last minute when the 'Mail on Sunday' published an article saying that the Solomons was one of the most dangerous places on earth! Having been reassured by the Commonwealth Office in London that any problems would not affect us, we departed using Singapore Airlines' excellent service. We spent two rewarding days in the beautiful city of Singapore visiting the Kranji Memorial and also the Changi Chapel and Museum. We then flew to Brisbane in Australia where we spent one day. The next day we were at the airport early to catch our flight to Honiara, the capital of the Solomons. The plane was full - a reassuring sight! We were greeted in Honiara by a local pipe band and were met by the British High Commissioner, Brian Baldwin and his wife. They took us to our hotel in Honiara where we spent 3 nights. 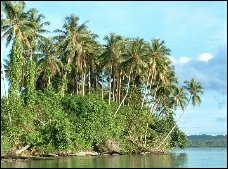 We then flew to Gizo (the second largest town in the Solomons) where we stayed for 5 nights. The flight itself was breathtaking looking down on some of the 970 plus islands that make up the Solomons. The colours of the ocean were incredible. Our hotel here was on the waterfront and there was much to watch from the 'leaf haus' restaurant.We had two wonderful trips from Gizo organised by Danny and Kerrie Kennedy - one was to Kennedy Island where J F Kennedy was shipwrecked in World War II when his PT109 was sliced in half by a Japanese ship and another to beautiful beaches where we swam and snorkelled. The abundance of fish life on the reefs was amazing - such beautiful colours. We also walked to a high point behind Gizo to view the ocean and the reefs. Again, everywhere, the people were so kind and friendly. After a 50 minute journey, both boats came ashore to an incredible welcome in Maleai! The whole village of about 1,000 inhabitants must have been on the shore to greet us. Two warriors appeared brandishing shields and spears and threatened us (fortunately they were just pretending!) We stepped ashore and were introduced to the Chief and the tribal elders and were given garlands of beautiful white frangipani as a welcome. We were then able to listen to the wonderful singing of the schoolchildren, all in uniform, who sang a special song welcoming us to their island - the whole scene was unbelievable. We walked through the village to the house where we were to stay which was 4-bedroomed, built on stilts. The 12 of us were to share this house with one 'loo', one cold rainwater shower and a well. The first evening we attended the service in the village church, built of concrete with wooden pews. The church was full and we had never heard such beautiful singing with no piano, organ, hymn books etc. The joyful sounds which echoed from this church would have graced any cathedral. A special dining 'haus' had been built just across the path from our home where the local ladies had devised a rota to look after us. How well they did - the freshly prepared food was a sight to behold even though the choice was mainly fish, fish and more fish. There was also rice plus many locally cooked vegetables which were quite tasty although we didn't know exactly what they were! The fruit was wonderful especially the pineapple. A special treat each day was the wonderful fresh bread for breakfast baked by Sarah in her 'kitchen' where an oil drum was used as an oven under which was an open fire - no temperature controls here Delia! After eating we had a short break before being taken to the centre of the village near our house. There the 12 of us sat under a corrugated iron-roofed shelter to be 'entertained' by different groups from the village. 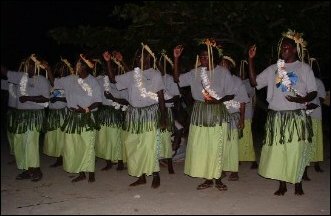 The ladies were first with their traditional dancing after which the 'visitors' were invited to dance with the locals. Even the slightest 'wriggle' of the hips from the visitors brought forth a huge scream and cheer from the whole of the village - now we knew what it felt like to score the winning goal in a cup final! 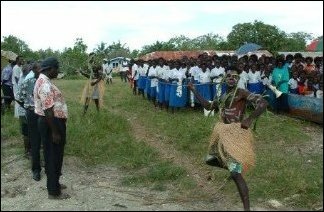 The young men of the village were next and they performed their snake dance. What an evening - the children had all been so well behaved and had loved every minute. We went to bed very tired but the night turned out to be extremely short! At about 3.45 am the first cockerel's cry echoed through the village followed shortly by another and another - how many were there? This was like a dawn chorus except it wasn't yet dawn! During the day, these chickens could be seen wandering at will through the village. Wherever we went in the village we seemed to be followed by a crowd of wide-eyed children. To think that most of them had never seen a car, a shop, television etc. They didn't have a single toy between them, yet were so contented and happy. Many of them played in the shallow lagoon in dug-out canoes, tipping each other out etc. and really having fun. Also, as soon as they could toddle it seemed as though they carried a lethal looking bush knife around with them. Some of them were wary of us at first, not having seen a 'white man' but they soon came round and ran up to take our hands etc. Liz and Carol taught them some English games and they all wanted to join in. The following day men from the village took us back to the island of Ballalae to prepare a site for the memorial plaque kindly donated by the Royal Artillery Association. We explained what we would like and they quickly set to work. 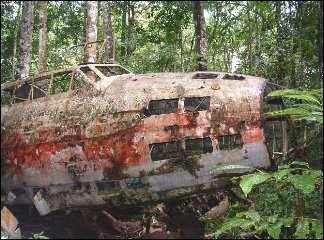 Meanwhile we were taken by other guides across the air strip and into the jungle where there were so many Japanese planes still sitting where they had been left 60 years earlier. There was certainly an eerie feeling about the whole place. It was a tortuous route and we were extremely fortunate to have the experienced locals with us who knew exactly where we could and could not go. We were then taken by boat round the island to where the British POW compound would have been and the beach here was certainly idyllic - did the POWs ever know where they were exactly? I doubt it. 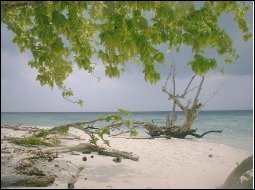 Beautiful white sand and swaying palms! Back to the air strip where the memorial was looking fine and we had the cross that Bill had brought standing behind the plaque with the Royal Artillery badge affixed. On Friday we visited the local school where the teachers had not been paid for months because the Government has no money!! The British High Commissioner presented the school with a wind-up radio ready to receive BBC World Service when it arrives in the Solomons shortly. There were very few books to be had and one reading book was shared among a whole class of about 40 children. We had a very enjoyable time with the children and they entertained us by singing some beautiful songs. Later we were also luckily able to meet and speak with two elderly gentlemen of the village who were on Ballalae under Japanese occupation and who could clearly remember the white prisoners of war arriving by boat on the island at the end of 1942. They said they were allowed no contact with them but tried to get cigarettes and some food through to them whenever possible. The afternoon was spent swimming and snorkelling on some of the most beautiful reefs and beaches imaginable. On Saturday, the planned day for our service on Ballalae, we left Maleai early and headed by boat for the island. 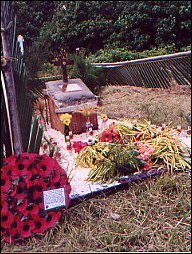 Some of the village men had slept on the island overnight and gave us a real surprise as they had decorated the memorial with hibiscus and palm fronds. It had been arranged for a priest from the local mission to conduct a short service for us. He gave a most appropriate address, followed by some wonderful singing from the local men. The British High Commissioner then said a few words followed by Carol Cooper reading the FEPOW prayer on behalf of Alf Baker, (a dear FEPOW friend in England who himself should have gone to Ballalae in 1942 but, together with 81 other POWs, was too ill to leave Rabaul, the last stopping off place of the prisoners before their final journey to Ballalae.) The service ended with a tape recording of the Last Post and a 2-minute silence followed by Reveille. Wreaths and small crosses were then laid, some on behalf of relatives who had been unable to make the journey. It was a truly wonderful occasion and all of us felt so proud and honoured to have at last paid tribute to all those brave men who had sadly lost their lives on this island 60 years ago. During the open boat journey back to Maleai we encountered a tropical downpour and all arrived back at base looking as if we had swum the whole 10 miles - luckily it was warm rain and we soon dried out!! During our final night of 'entertainment' it was felt that we, the visitors, should make a contribution. Not knowing how we could possibly compete with the local tribal dancing we unanimously decided to give the locals our rendering of the Hokey Cokey with all 12 of us standing in a long line to perform. When it came to…. 'whole self in, whole self out'.... the locals went wild and their voices were raised to a crescendo - we came to the conclusion they liked it!! On our final day it was very sad to say goodbye to the islanders and many of them came to wave us off including the Chief and Elders. As Maleai disappeared from our sights we were all lost in our own special thoughts at the way we had been accepted by this wonderful community. They said there would always be a special link to us through Ballalae which had brought us together and we will never be able to thank them enough for their hospitality and the warmth of their friendship. They had so little in the way of material things yet were prepared to share it all with us. The small plane duly landed on Ballalae and after boarding we took off for our last glimpse of this very special island which really is a minute dot in the vast Pacific Ocean. We spent our final two days in the capital, Honiara, where Brian and Liz kindly invited us to their home for afternoon tea. It was soon time for our long flight home after what had been a journey that really had exceeded all our expectations. None of us will ever be able to thank Chris Cowx enough for all his help, encouragement and time spent without which this pilgrimage would certainly not have been possible. It was pure fate that he came across our COFEPOW site on the web when he did! Our sincere thanks must also go to Chief Chris, Mr and Mrs Taneko, their daughter Sandra and all the villagers of Maleai for their kindness and hospitality during our stay with them. A leaflet picked up from the Solomon Airlines Office says on the front 'A WORLD YOU NEVER KNEW STILL EXISTED' - how true that is!!! By June 2007 the memorial had deteriorated badly and was also damaged by an earthquake and tsunami earlier that year.